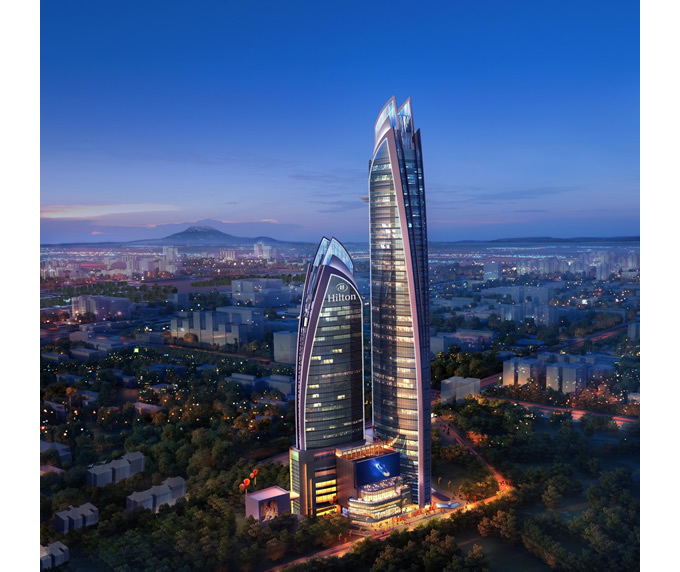 Expected to open in 2020, Hilton Worldwide (NYSE:HLT) has unveiled plans to built the tallest hotel in Kenya’s capital, Nairobi. Hilton Worldwide (NYSE:HLT) has unveiled plans to built a 255 guest-room and suite hotel in Kenya’s capital, Nairobi – expected to open in 2020. An estimated $110 million has been budgeted for the construction of what could be the tallest hotel in Africa. Hilton announced on Monday that it had reached a management agreement with Jabavu Village Ltd to open a 255 guest-room and suite hotel. The hotel joins 50 Hilton Hotels & Resorts properties trading or under development in 17 countries across Africa. Co-developed by Jabavu Village and White Lotus Projects, Hilton Nairobi Upper Hill will comprise of an Executive Lounge and five food and beverage outlets, including a relaxing poolside bar, speciality smokehouse and grill restaurant, lobby dining area with landscaped deck and a boutique rooftop bar with unbeatable vista views of the Nairobi skyline on the 43rd level. Business travellers will have a wide choice of professional facilities to choose from including a ballroom and meeting rooms of approximately 1400sqm. Guests will also have access to an outdoor pool and fitness and spa centres.